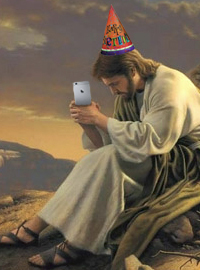 Jesus Christ waits on his birthday for his father to call. RENO, NV – For the 1,093rd year in a row Jesus Christ has not received a birthday gift or a call on his birthday from his father. While he does occasionally talk to his father, Christ has spent the last 1,093 years waiting for a birthday call. Christ hasn’t spoken to his father about the issue but he has told his step-mother, Anna Nicole Smith, that all he wants is for his father to call him on his birthday. Despite the strong words from his father, Jesus is hopeful that this is the year that things finally change.